The key is that each tag will have a journaling prompt. I’ll tell you why I’m making these later but let me just say they are so fun to make. 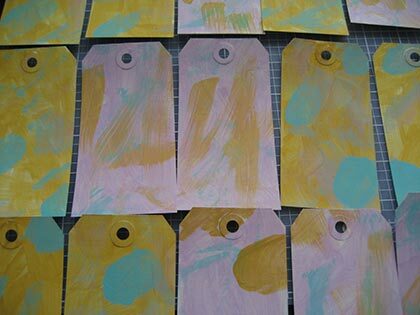 In other crafty adventures, I’ve succumbed and started a Facebook Fan Page for Bookgirl’s Studio. I figured that might be an easy way for people to keep up with what’s going on in the Studio. I’ll always mention sales, new products, etc. here as well but if you are on Facebook and want to be my fan, I’d greatly appreciate it! And, speaking of Bookgirl’s Studio, I’m having an End of Summer Sale this weekend on some of my beaded journals. You can already check them out here. I’m just trying to make room for some new stuff. Ooh! I love the swirly stamp. I really love your tags. 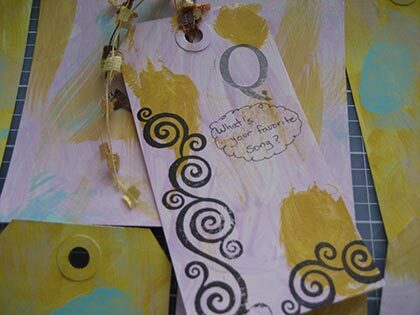 What great prompts for scrapbooking. You are so creative! I always hope that if hang out near people like you, some of it will rub off on me! i wish i knew how you do that… i would have made bookmarks! Ladytink_534 – I’m amazed at how many times I’ve used that stamp on other projects. Just a fun one to have! 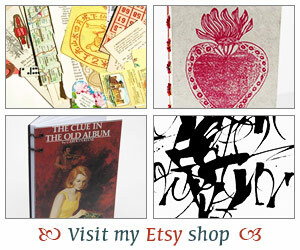 vivienne – Thank you and yes, they’d be great for scrapbooking too. I don’t do as much scrapbooking nowadays but I want to get back into it! Sandy – You are too funny. I bet you’d come up with some cool stuff too! Molly – Thank you and oh wow, I think that’d be a great way to get your students journaling! Sometimes people just have a hard time knowing what to put on paper and this is a way to just get thoughts down. Veens – Ah, I just play around. It’s amazing really how much we can all do if we only just learn to let go of expectations and try 🙂 And, you know, I have made bookmarks with those tags before. I should make some again! These are so cute. I can’t wait to become your facebook fan! Those are really cute (and I may have to check out the sale before I go on holiday). Yikes, you have joined the Facebook. I am still resisting. I have received about 20 people who want to friend me, but I don’t want to join. Tags, great looking. Keep having fun. Cool tags! I haven’t joined Facebook or Twitter–I know they are popular, but I can’t even keep up on blog posts, so I think I’d just feel totally overwhelmed. Good luck with it, though–I know lots of people love both! Love the tags. Can’t wait to hear what they’re for.